The ASA Federation is proud to have over 330 clubs in 37 states. ASA Federation clubs host competitions that feature our standardized set of competition rules; professionally executed shooting ranges; standards for dress and conduct; safety standards that include a maximum arrow speed; and our copyrighted 12-ring scoring system. The ASA Federation is focused on the growth of 3-D archery by supporting local clubs and making a commitment to youth education and training. 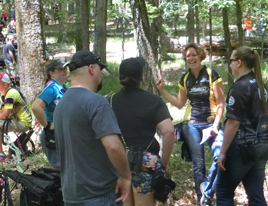 The ASA Federation includes experienced archers and coaches that work year-round conducting well organized and challenging events that are enjoyed by seasoned participants and newcomers alike. ASA 3-D Archery: ASA 3-D archery features competitive rounds of lifelike, three-dimensional animal targets made of foam. The scoring rings are not always visible from the shooting stake and binoculars are allowed. Advanced archers must determine the distance to the target, pick a good aiming point, and execute the shot. The ASA was the first archery organization to implement a speed limit (280 feet per second) for safety and to establish a level playing field for 3-D competition. Beginning in 2007, the ASA was the first national organization to incorporate Known Distance 3-D which provides competitors with another option, as well as providing a more accessible starting point for new competitors. ASA Scoring: The ASA uses a scoring system of 12, 10, 8, 5 or 0 points per arrow. Scoring is based on zero points for a miss, five points are earned for a hit anywhere in the body, eight points for the largest outer scoring ring on the animal, ten points for the five-inch circle inside the 8-ring, and twelve points for the smaller rings which are offset to the bottom and top of the 10-ring. Delivering fun, easy to attend events is our calling card. We make sure your tournament experience is amazing. Great sponsors, great competition, and unforgettable experiences make for the best in 3-D archery competitions. ASA provides the opportunity to shoot with the pros. Our "Team Shoot" events could find you paired up with our sports best athletes! ASA strives to be the leader in 3-D Archery competitions. With such a large and diverse shooter base you are bound to enjoy our competitions and events.